We don’t know much aboutAvengers: Endgame, but we do know this based on the trailers: Our heroes are going totake on Thanos, try to take the Infinity Gauntlet, and use the Stones for themselves. If they’re lucky. But once youuse the Infinity Gauntlet to undo the bad guy’s plan, what do you do with it? After all, you’re only one slip up away from Thanos — or someone even worse — taking it right back. Every universe in Marvel’s Multiverse has its own Infinity Gems, Stones, or what-have-you. For example, inthe Ultimate Universe, there are a whopping eight Infinity Stones, four for each of thetwoInfinity Gauntlets. 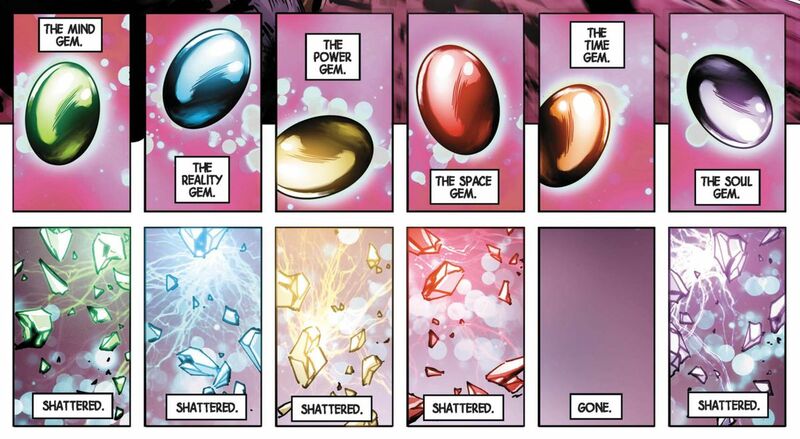 The existence of the Infinity Stones seems to be a necessary part of the fabric of each Marvel cosmos. The second thing you need to know about the Infinity Stones is that they usually wind up in the possession of Adam Warlock (despite the name, he’s a good guy), a character who has never directly appeared in the Marvel Cinematic Universe, although he’s beenhinted at. And when a court of the most powerful beings in the Marvel Comics universe ruled that he was not capable of wielding the Infinity Gauntlet responsibly, they didn’t use their near-infinite power to destroy the Infinity Stones. They just made him split them up and give them to other people. The Living Tribunal (the big gold guy), Adam Warlock (in the red cape), and Eternity inWarlock and the Infinity Watch#1. Not one member of this group of the most powerful entities in Marvel Comics, including Eternity himself (that’s the swirly galaxy guy on the right), proposed the much more final solution of outright destroying the Infinity Stones. “But maybe,” you might be asking yourself, “Eternity and the Living Tribunal and all those other wacky cosmic dudes just weren’tpowerfulenough to destroy the Infinity Stones, which gives their bearer literal omnipotence.” It’s the oldCan God make a rock so heavy even God couldn’t move it?question. But Marvel Comics has answered theOmnipotence paradox, too. The Illuminati are a secret cabal of the most intelligent and politically powerful superhuman figures of the Marvel Universe, and they mostly get together to make ethically dubious secret decisions about things that threaten Earth. In 2007’sNew Avengers: Illuminati#2, Mr. Fantastic proposed that he and the rest of the Illuminati should gather the Infinity Stones in order to safeguard them from those who would exploit them. Mr. Fantastic, the Illuminati, and the Infinity Gauntlet. The Infinity Gauntlet cannot destroy itself. Rather than keeping the Gauntlet together after this, the six members of the Illuminati decided to each take an Infinity Stone and keep it very, very secret. When Captain America did it by accident. The next time the Illuminati brought the Infinity Stones together it was to defend the Earth from an Incursion — another universe in the Marvel Multiverse that was colliding with the main Marvel one, with potentially catastrophic results for both worlds. As the strongest-willed of the Illuminati, Captain America used the Gauntlet to push an entire universe away from his own, and when he was done — it broke. It’s possible this will be how things end up inAvengers: Endgame. But if it isn’t, there’s another very traditional Marvel way to deal with the Infinity Stones. The Infinity Gems have only been destroyed once, and when the entire Marvel Universe was destroyed and recreated in Marvel’s 2015Secret Warsevent, they were recreated along with it, as the Infinity Stones (to better match the movies, naturally).Usuallywhat happens after they’re recovered from a bad guy is that they are scattered across the universe so no one knows where they are. Or, just as often, they are given to trustworthy stewards who are charged with defending them against all comers, and that group of six heroes has a traditional name: the Infinity Watch. When the stones are aren’t lost, shattered, or sitting in the Infinity Gauntlet, there’s usually an Infinity Watch around to defend them. The original Infinity Watch comprised Adam Warlock, Gamora, Drax the Destroyer, the telepathic hero Moondragon, the diminutive Pip the Troll, and (yes) Thanos. A very short-lived Infinity Watch, assembled by Doctor Strange, came together in the lead up to Marvel’sInfinity Warsevent in summer 2018, featuring Black Widow, Captain Marvel, Star-Lord, Adam Warlock, and low-level NYC criminal Turk Barrett. And the aftermath ofInfinity Warsevent, the Infinity Stones were scattered, again but with a new twist. You can’t use the Infinity Stones to destroy the Infinity stones, but apparently you can fundamentally change them. 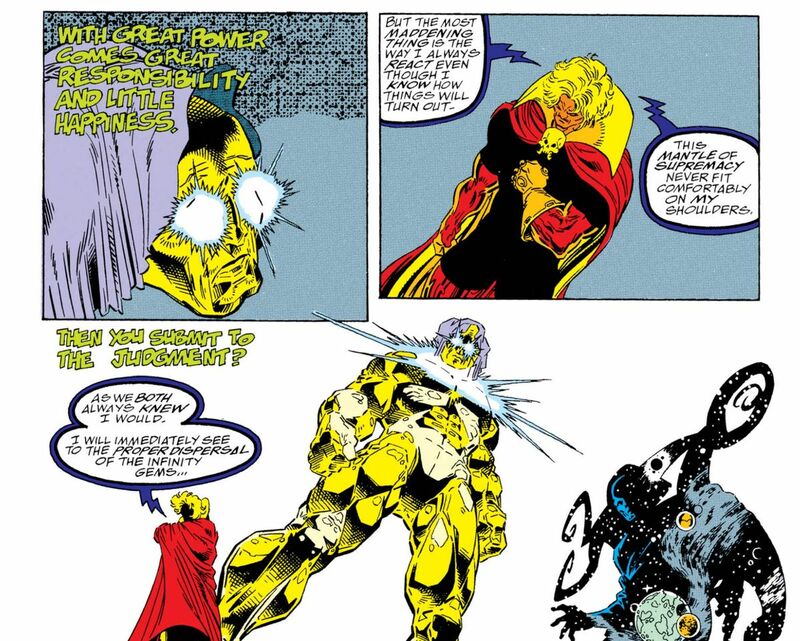 At the end ofInfinity Wars, Adam Warlock used the Soul Stone to give each Infinity Stone a soul. The idea was that with sentience and their own will, the Stones could be their own Infinity Watch, zipping around the universe to find a safe space to hide out. But the Time Stone didn’t hide quite well enough, merging itself with an otherwise unremarkable human man named Hector Bautista, who used his newfound power to stop time to walk out of a Texas prison. And so there’sa new Infinity Watch of sorts— comprising Loki, a newly resurrected Wolverine, and Doctor Strange’s talking ghost dog — who are doing their best to keep the worst people in the universe from getting their hands on Hector. 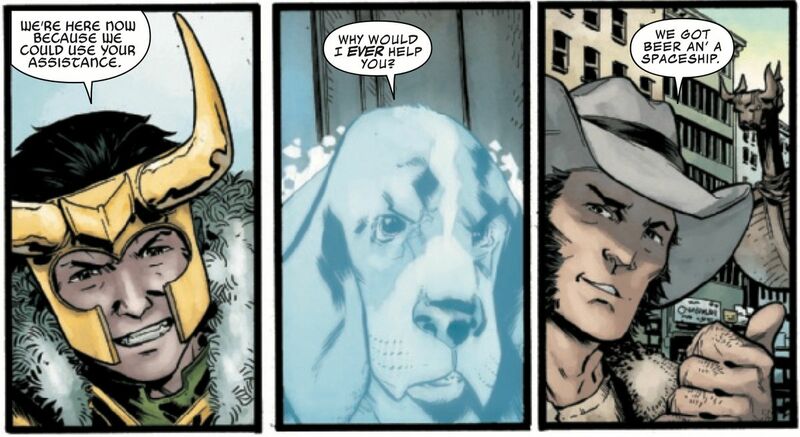 Loki, Bats the Talking Ghost Dog, and Wolverine inWolverine: Infinity Watch#3. Any of the above! Just because the Infinity Stones can generally never be destroyed in the comics doesn’t mean that they couldn’t be in a movie. The thing about all these fates of the Infinity Stones is that they all leave open the possibility that the Stones could return whenever writers need them to. If destroyed, they could be remade. If scattered, they can be found. If changed, they could spark a whole new story. And if given to the Infinity Watch, they could found an entirely new superhero team with a brand new cosmos-spanning mission. We’ll have to wait untilAvengers: Endgamehits theaters on April 26 to find out.